This radio receives only from 30 to 75.95 MHz FM in 50 KHz steps in two bands. The front panel squelch switch selects either the "old" squelch (noise quieting) or the "new" squelch (150Hz.) There is no internal speaker, but a external speaker can be connected via the front panel audio connectors. This radio requires 24 VDC at 2 amps when receiving. For full description and specifications CLICK HERE then use your back button to return. These radios are used but have been realigned and thoroughly tested and are guaranteed to meet or exceed the military specifications. Appearance wise the radios are in good condition with no physical damage but they are cosmetically challenged, having faded paint and top and bottom covers with non-matching colors. The front panels are in good to very good condition. If you're not happy with your purchase you can return it within 10 days for a refund of the purchase price. 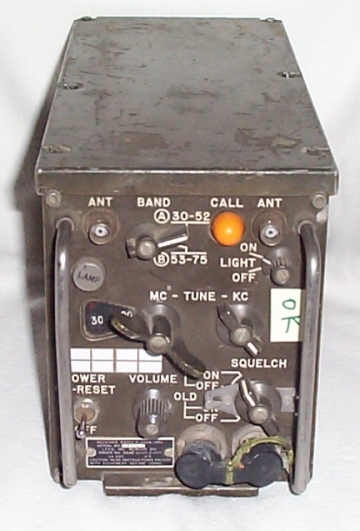 R-442 Radio, Used, G to VG $ 225.00 plus shipping. Display model $79.99 plus shipping. to email me your shipping address so that I can provide you payment information. HURRY! ORDER NOW, QUANTITIES ARE LIMITED! DON'T MISS OUT ON THIS OFFER.